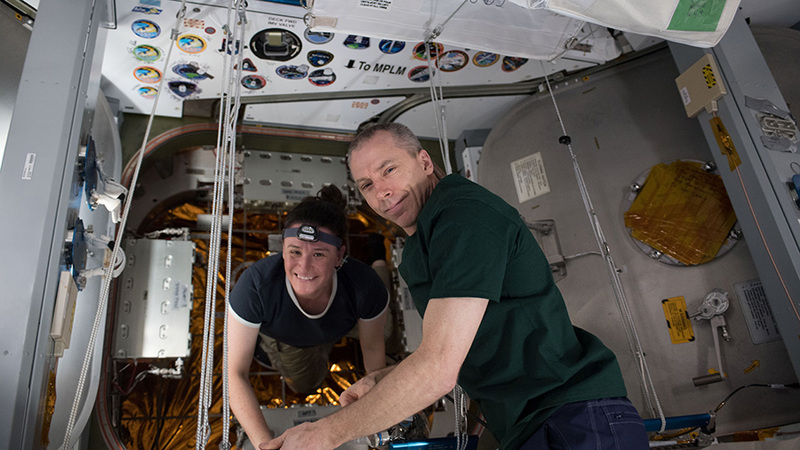 NASA astronauts Serena Auñón-Chancellor and Drew Feustel begin cargo operations shortly after the SpaceX Dragon cargo craft arrived at the International Space Station packed with more than 5,900 pounds of research, crew supplies and hardware. Cancer and rodent studies were on the crew’s timeline today to help doctors and scientists improve the health of humans in space and on Earth. The crew also conducted an emergency drill aboard the International Space Station. Flight Engineer Serena Auñón-Chancellor examined endothelial cells through a microscope for the AngieX Cancer Therapy study. The new cancer research seeks to test a safer, more effective treatment that targets tumor cells and blood vessels. Commander Drew Feustel partnered with astronaut Alexander Gerst and checked on mice being observed for the Rodent Research-7 (RR-7) experiment. RR-7 is exploring how microgravity impacts microbes living inside organisms. Astronaut Ricky Arnold and Gerst collected and stowed their blood samples for a pair of ongoing human research studies. Arnold went on to work a series of student investigations dubbed NanoRacks Module-9 exploring a variety of topics including botany, biology and physics. During the afternoon, all six Expedition 56 crew members joined forces to practice a simulated emergency. The orbital lab residents went over escape routes and safety procedures while coordinating communication and decision-making with mission controllers in Houston and Moscow.